There is likely no larger industrial meeting place for oil and water than a steel mill. Because of the massive amount of water that is needed for process cooling and descaling, and the similar quantity of hydraulic, lubricating, and cooling oils that are required in steel production, the adage that oil and water do not mix is put to the test and proven every day. It can take between 10,000-75,000 gallons of water to produce one ton of steel, depending on the amount of recycled water that is used. Reusing water whenever possible is crucial to maintaining costs, and to be able to reuse water in the majority of steel mill processes it needs to be free of contamination, namely oil. Tramp oils commonly contaminate steel mill process water and this can lead to a variety of problems. Water purity is obviously affected which means that the effectiveness of this water in its role as a coolant or lubricant is reduced. Additionally, water that is contaminated with oil cannot be discharged into a facility’s wastewater system, as this can potentially cause a hazard to the environment. Finally, the presence of some oils in water can provide an ideal media for bacteria growth that can present unsafe working conditions for workers. All of these factors contribute to a mill not being able to recycle water, which means increased production costs. What counter measures can be employed at a steel mill to limit or eliminate process water from becoming contaminated with oil? For one, the Abanaki Model 8 Belt Oil Skimmer is a dependable and effective means of removing oil from water and water-base solutions, such as those found in mills. Oil skimming makes use of the differences in specific gravity and surface tension between oil and water. These physical characteristics allow the belt skimmer to attract oil and other hydrocarbon liquids from the surface of the fluid. The Model 8 can be used in tanks with depths as shallow as one foot, or as deep as 100 feet, and is built to last. With the proper configuration it can handle liquid temperatures up to 212°F, and the pH of the fluid can range from 3 to 13. The skimmer drive includes an oil filled gear reducer with bronze gears and ball bearings. The motor, reducer, and powder coated finish of the housing give the Model 8 exceptionally long life, even under the harshest conditions. For more information about the Model 8 or other Abanaki products, call your sales representative at (440) 543-7400, or simply click at the button below. Oil skimming is the most economical, low-maintenance method for removing floating oil, grease, fuel and other hydrocarbons from water. As the oil skimmer belt or tube passes through water, the contaminants are attracted to the media and carried to wiper blades where the oil is removed. Oil skimming uses the differences in specific gravity and surface tension between oil and water to pick up oil, grease and other hydrocarbons. Oil Skimming can be used in a wide variety of applications and can keep your company in compliance with EPA regulations. Selecting the right belt material is just as important as selecting the right skimmer. You might choose the right skimmer but the wrong belt type and the skimmer will not work correctly to solve your oil in water problem. It is crucial that things like pH, temperature, and oil type are considered when selecting a skimmer AND a belt type. A belt is to a skimmer like wheels to a car’s chassis: although the latter is the most identifiable part, it needs the former to actually run. Just like tires, belts are not one size fits all. Just as there are snow tires, street tires, year-round tires, and more, so too are there a variety of belt materials. So, what purpose does each serve? There is a great deal of variance in applications where belt oil skimmers are present. Figuring out what would be the best belt material for your belt skimmer will depend on a few factors. For the most part, belts pick up the oil in the same fashion so the big difference is finding what will give you the longest operating life. Steel belts are the standard for many applications. Their durability, corrosion resistance, and strong oleophilic tendencies make the material effective in most scenarios. The lower price and ease of welding also reduce costs. The biggest caveat is their ineffectiveness when confronted with rust inhibitors in wash water. Steel belts are also ineffective in most applications where Petro-Xtractors are used. Elastomer belts are an alternative to steel belts that perform well in a multitude of situations. These belts can handle some of the harshest, most abrasive conditions a skimmer can be placed in and are fully compatible with the Petro-Xtractor. Still, steel belts will not stretch when exposed to UV rays over a long period of time. Polymer belts, commonly shortened to poly belts, are meant for higher temperatures and conditions where UV exposure and rust inhibitors are an issue. The textured nature of the poly belts causes more oil than usual to be picked up. This option tends to be pricier, but works like a charm in intense functions. This video demonstrates how choosing the right belt material makes all of the difference. The Fuzzy belt does a better job at picking up the hydrocarbon than the standard belt on the right. LFO belts, commonly referred to as Fuzzy belts, are a proprietary skimmer belt exclusive to Abanaki. This material specializes in the rapid removal of light, non-viscous hydrocarbons from water. If your problem is an oil like gasoline, the Fuzzy belt will remove it much more efficiently than any other belt in normal conditions. The Fuzzy belts are also extremely resistant to stretching. 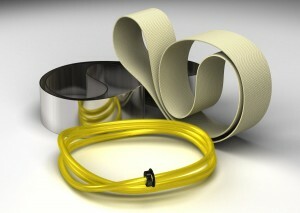 XP polymer belts, commonly shortened to XP poly belts, are very similar to poly belts. The key difference comes in its texture and temperature resistance. The XP poly belt is better able to handle high temperatures, maxing out at 180ºF. The belt also has a smooth texture rather than the ridged design of the standard poly belt. Although this change means the XP poly belt will not pick up oil as quickly, the belt will function better than the standard poly belt in conditions that would wear away the ridged design. More information can be found in the Abanaki Oil Skimmer Factbook or Abanaki Belt Selection Guidebook. It is best to call (440-543-7400) with details of the application and ask your Abanaki representative what will work best with your belt skimmer. Coolant skimmers typically don’t come attached to CNC machines when they are newly bought. This is because nobody wants to admit that the brand-new machine is eventually going to leak oil into the coolant. This looks good on paper, but there is a reason why so many coolant skimmers are bought annually. CNC machines are bound to have at least a small amount of oil leaking into the coolant at some point. The skimmer will remove this oil from the top of the coolant for disposal. Without some type of coolant skimmer, the coolant life will be dramatically decreased. These small coolant skimmers will save you money throughout the operational life of your CNC machine. Coolant skimmers can really help in extending the life of your costly coolant. 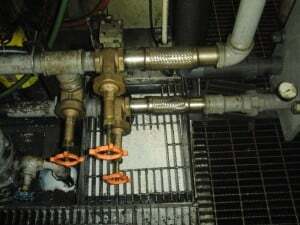 Coolant skimmers help remove oils that leak from machines or parts to keep your coolant clean. By removing the oil with coolant skimmer, you can significantly increase the life of your coolant. So, is your product quality being affected by floating oil? Have you asked yourself how you remove oil from water effectively and efficiently? One of the best coolant skimmers of Abanaki coolant maintenance line is Mighty Mini Oil Skimmer. It is a belt style skimmer that will remove the floating oil that is compromising your product quality, reducing your coolant life, and stinking up the shop. Putting an oil skimmer in your coolant tank will allow you to remove this oil from the top of your coolant 24 hours a day if needed or you can set the timer to turn on in 15-minute increments. A belt oil skimmer is easily maintained and the only consumables are the belt and wipers. We have been providing oil skimmers for years to machine shops and manufacturers across the globe and they have proven to be both reliable and cost-effective. The Mighty-Mini is a belt style coolant skimmer that is ideal for a wide variety of applications due to its stainless steel construction and its built in timer. This skimmer comes standard with a steel or Elastomer belt. To find out more about Mighty-Mini Oil Skimmer, please contact our experts at 440-543-7400, or click the button below to get your Mighty-Mini Brochure. It’s the age old question; which is better? The belt skimmer or the tube skimmer for collecting floating surface oils from various applications? Some feel that belt skimmers work better because it takes up less space while still collecting oil from large surface areas. Other people feel that the tube skimmer works better because the tube covers more of the tank or pit’s surface. The fact is that both skimmers use the same principle of breaking the surface tension of the water to allow the oil to adhere to either the belt or the tube. There are a lot of belt and tube oil skimmers out there, but how do you figure out which one will work best for your specific application? There are two things that should be looked at immediately. First, how many gallons per hour of oil are you looking to remove? Every skimmer model is rated for the gallons per hour that can be removed. The next thing to look at would be the dimensions of your tank. The different sizes of skimmers will be able to pull in oil from different distances. Even if you have a fairly low amount of oil, a smaller skimmer may not work if the surface area is too large. You can make your own decision which is best by visiting www.abanaki.com . There is a full line of belt skimmers and tube skimmers to compare. Or, the best way to match up a proper skimmer to your exact application is to call your Abanaki sales representative @440-543-7400. There is a skimming system for virtually any application.Fill out the form, and you will have immediate access to this guide. Abanaki oil skimmers have been at work in mines around the world for decades. Typically located in remote areas, wastewater treatment facilities are often not available, so water must be reused onsite. Oil skimming cost-effectively removes oil from wash bays so that the water can either evaporate or can be reused. When washing large equipment, diesel, oil, and grease, along with mud and debris get rinsed into a sump. Abanaki has three solutions that can be used in this situation: the Oil Grabber Model 4, Portable Tote-It, and the Oil Viper tube skimmer. The Oil Grabber Model 4 is the most commonly used solution at mines. Its heavy-duty construction withstands the harsh environment inherent to the industry. Specially designed belts can collect all of the oil products present in the wash bay, and coupled with the optional Oil Concentrator, they effectively remove the oil without picking up much water. The Portable Tote-It works well in smaller wash bays or in other parts of the mine where water and oil are present. As with the rest of Abanaki’s product line, it is available in stainless steel, which resists the strong chemicals that can be present at a mine. Two sizes are available based on belt width: 2″ and 4″. Abanaki’s Oil Viper tube skimmer has a small footprint, but large recovery rate. The tube “snakes” around the pit and can collect oils and greases with ease. It works very well in shallow sumps or confined spaces. Oil skimming can reduce the amount of labor needed to keep wash bays clean by mechanically removing the oil. Unlike socks or hand-held skimmers, Abanaki’s equipment is able to run continuously or on a timer to eliminate the need for manual labor. 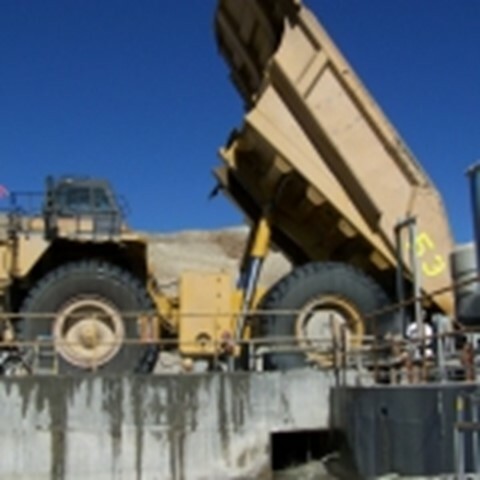 Wash bays are typically small and located near the mining pit and would not merit a large, expensive water filtration system. Oil skimmers are an economical way to remove the oil. 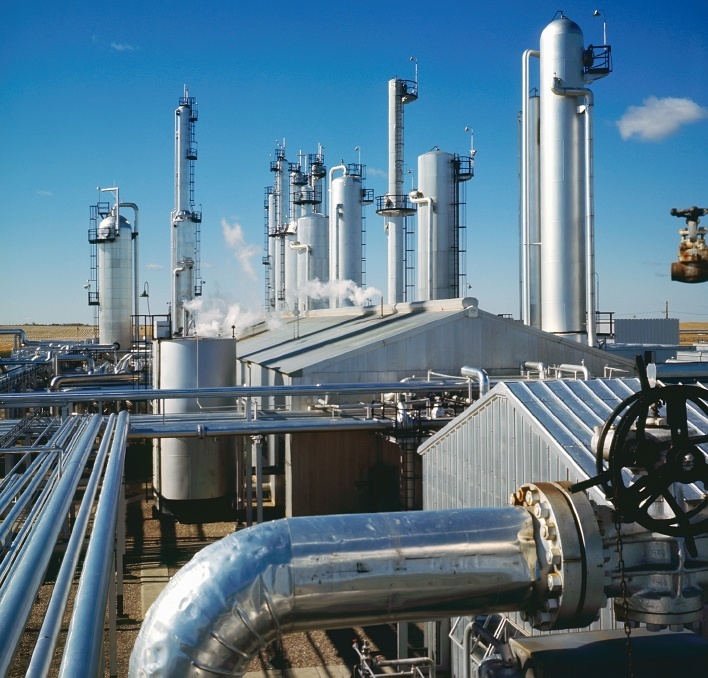 Refineries are capable of producing gasoline, jet fuel, or even asphalt and, like most large-scale high capacity plants, require process optimization and advanced process controls. Oil skimming is a popular method for capturing and removing oil from wastewater in plant treatment systems. This process is mandatory to avoid fines and to produce fuel as economically and environmentally friendly as possible. Abanaki Corporation has successfully specialized in refinery oil skimmer technology for over 40 years. Oil skimmers work by making use of the differences in specific gravity and surface tension between oil and water. These physical characteristics allow the belts to attract oil and other hydrocarbon liquids from the surface of the fluid. Abanaki belt skimmers can be used in applications as deep as 100 feet. By implementing an oil skimming solution, the goal to recapture 100% of all hydrocarbons before they go down the drain, can be achieved. The oil skimmer collects the bulk of the hydrocarbons and sends them back to a crude tank. Any residual oils can be removed through filtration or chemical treatment. The oil skimmer is operated 24 hours a day 7 days a week. A refinery oil skimmer requires very little oversight, no maintenance, and the time saved more than offsets the electrical costs. The Model 8 oil skimmer is the most widely used Abanaki oil skimmer. Its size and removal capacity make it suitable for most applications. From a mere shimmer on top of water to a heavy oil slick, the Model 8 oil skimmer performs efficiently, removing up to 40 gallons of oil per hour. The new solar-powered version of Abanaki’s popular Model 8 Oil Skimmer is available. It removes oil at up to 40 gph, where electrical power is unavailable or inconvenient. The Abanaki Model MB oil skimmer is a dependable and effective means of removing oil from water and water-base solutions. Often, oil skimming by itself will reduce oil to an acceptable level of water purity. Depending on the characteristics of the liquid, it is possible for the Model MB alone to reduce oil content to less than five parts per million in water. The unit can be used as a pretreatment before filtration, and in conjunction with a coalescing system. The Model 4 oil skimmer utilizes a continuous belt and wiper to remove up to 20 gallons of oil per hour from the fluid surface. Depending on the application, a belt skimmer such as the units described above can be used or a tube skimmer like the Oil Viper would be another viable solution. The Abanaki Oil Viper tube skimmer is a surface oil skimmer that effectively removes floating surface oils by means of an oleophilic (oil attracting) 3/4 inch diameter continuous looped tube. The tube extends out over the surface of the tank or pit and collects the free floating oils. The Oil Viper has a specially designed method for removing the oil from the tube. It has a unique wiper combination attached to the tube itself in addition to the ceramic wiper on the skimmer. The result is a virtually oil free tube as it leaves the oil skimmer for quicker oil removal. Removal rates can be as high as one hundred gallons per hour. It can be used in either shallow tanks or reservoirs. To find out which of our skimmers would suit your application the best, please contact our experts at 440-543-7400, or click the button below to get our most detailed resource E-Book on our oil skimming equipment. Sometimes, an important technological advance begins with a small step-back! Such is the case with remediation of hydrocarbons from groundwater utilizing existing recovery and monitoring wells. For the past few years, state government has based decisions on the amount of clean up that they require by the risk posed to the environment. Risk Based Corrective Action, commonly called “Rebecca” (RBCA), is a process that utilizes the principles of exposure assessment, toxicity and mobility to make corrective action decisions on sites that are cost effective while still protecting human health as well as that of the environment. Many times all they require is removal of the free-phase product, allowing any emulsified contaminant to degrade with time. RBCA has saved many millions of dollars both for taxpayers and for businesses. With state regulatory agencies taking this approach, oil skimming devices have emerged as one of the most cost effective groundwater remediation equipment choices. Wastewater engineers in industrial settings have, for many years, understood the value of skimmers in the removal of hydrocarbons from water. Food processing plants, the metals industry, machining firms and utilities have all used skimmers with great success for wastewater treatment. Recently, skimmer manufacturers have modified their product as groundwater remediation equipment. The belt skimmer’s ability to get into tight spaces and remove relatively large amounts of hydrocarbons lends itself perfectly to groundwater remediation. Since most oils, fuels and other hydrocarbon liquids have the tendency to float on water, skimmers are designed to remove only the top, free-phase, product layer. With only product being removed, the cost and maintenance of other down-well and water treatment equipment can be eliminated. Another cost advantage to skimming is that in many cases the product can be salvaged for reuse – further reducing the overall price by eliminating the disposal cost. The options for remediation equipment through recovery wells are practically unlimited since these wells come in a variety of sizes; any of the available technologies such as pump and treat of bio-remediation can be used in the correct size recovery well. Monitoring wells, however, are small, typically less than 4 inches in diameter. Initially installed for the monitoring of groundwater they are cheaper to construct and just large enough to allow a baling device or oil/water interface detector to pass through. As a cost savings measure, these small diameter wells are increasingly being used for product removal. With the increase in this new use, it is only natural that a number of devices are showing up claiming the ability to remove product through monitoring wells. With the requirements for groundwater remediation systems becoming more reasonable, the use of skimming devices in lieu of pump and treat systems is increasing. The enormous expense involved with treating millions of gallons of water including the remediation equipment, monitoring and related maintenance is being replaced with a much more common sense attitude. Skimmers, especially belt skimmers, as a means of remediation equipment, not only meet the challenge but, most times exceed. Pump and treat still has a place in this industry, but the small step “backward” to time proven skimming, a more reasonable and cost effective method, cannot be overlooked. To find out which of our skimmers would suit your application the best, please contact our experts at 440-543-7400, or click the button below to get our whitepaper, DNAPL A Threat? 9 Ways to Treat DNAPLs! 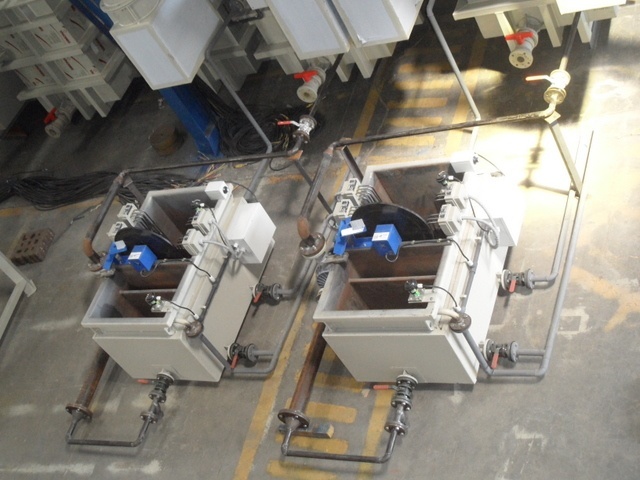 Abanaki offers industrial wastewater skimmers specially designed for steel mills where plant maintenance engineers are looking for the lowest cost, most reliable method of removing greases and heavy oils from the steel-mill scale pit. Abanaki oil skimmers use the difference in specific gravity and surface tension between grease and water, allowing the belt to attract grease and oil as the belt passes through the surface of the water. The simple belt-and-motor approach is proven to operate unattended and reliably for decades with little maintenance. To avoid fines from government and municipal sewer districts, steel mills must limit the amount of grease in wastewater discharged into the environment. The Grease Grabber® oil and grease skimmer provides a continuously operating belt and wiper that can remove up to 160 gallons per hour of heavy greases and oils. 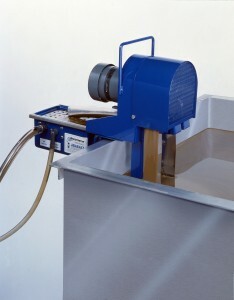 Depending on the characteristics of the liquid, the oil/grease skimmer is capable of reducing grease content to fewer than five parts-per-million in water. Reclaimed grease and oil can be re-used or used as furnace fuel, avoiding sucker truck disposal costs. Using a double drive roller and tail pulley system, the grease skimmer belt runs through wastewater to pick up grease and heavy oil from the surface. The belt travels over the head pulley and then passes through tandem wiper blades, from which oil is scraped off both sides and discharged. A heated hopper keeps grease flowing in cold outdoor temperatures. The tail pulley features flanges that allow the pulley to roll freely on the inside of the belt without becoming dislodged in turbulent applications. No bearings are needed; the unit does not need to be fastened to the tank. An optional tether and cage assembly is offered to prevent the tail pulley from being dislodged. The Grease Grabber oil skimmer can be used in pits with depths as shallow as one foot or as deep as 100 feet. 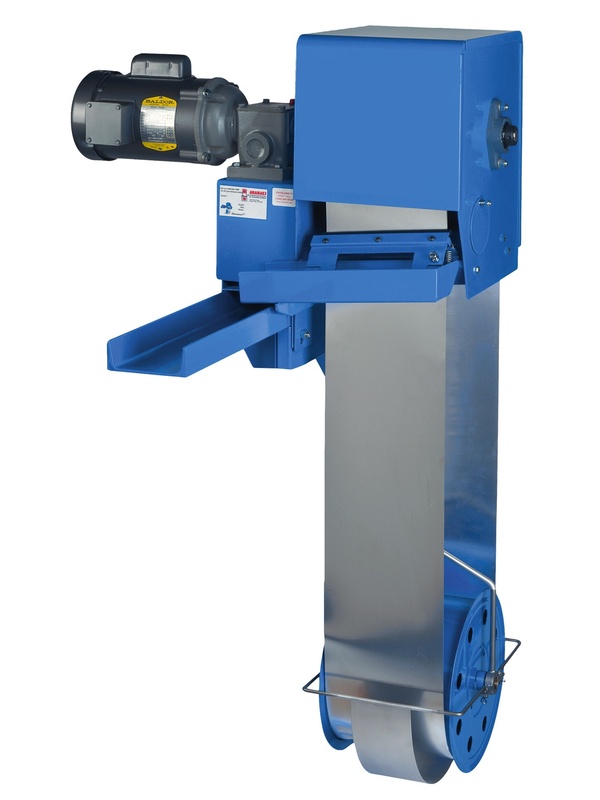 To find out which of our skimmers would suit your application the best, please contact our experts at 440-543-7400, or click the button below to get more information about Grease Grabber. Companies look for effective ways to remove oil from water or coolant to reduce costs and the liability of proper disposal. Another reason for removing the oil is a better work environment. Letting oil remain in the coolant tank allows anaerobic bacteria to grow. Anaerobic bacteria break down the components of coolant, causing it to need changing more frequently. Oil-laden coolant with a high anaerobic bacteria content has two other drawbacks as well. The first drawback is an unpleasant odor caused by the bacteria. The second drawback the smoke generated from the oil-laden coolant coming in contact with the operating cutting tool. One of the easiest ways to remove hydrocarbons from water or coolant is by using an oil skimmer. It is a low maintenance, easy to use tool for removing oil from water or coolant. Reduction of Disposal Costs: The cost of disposing oil laden coolant is more expensive than the disposing of oil. Recycling Opportunities: In some instances, companies may be able to re-use the skimmed oil elsewhere or sell it for recycling, choosing to keep their part of the world cleaner. Extend Coolant Life: Having oil free coolant can also extend its usefulness and effectiveness, reducing the expense on maintenance and coolant replacement. Esthetic Benefits: Removing the oil from a machine coolant tank will cut down on the amount of smoke generated from the cutting tool coming into contact with oil laden coolant thereby creating a visibly cleaner workplace. Extend Tool Life: Removing floating surface oils while aerating and refreshing coolant will extend tool life as well. Avoid EPA Violations: Many machining and metal working shops turn to aqueous parts cleaning because of limits imposed by the EPA on the discharge of emissions and wastes. Hygienic Benefits: Keeping coolant oxygenated and oil-free reduces the “rotten egg” odor and bacterial levels are lowered resulting in a cleaner work environment. 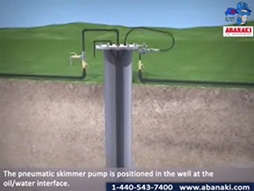 Abanaki Corporation manufactures a wide variety of oil skimmers to meet any size application. From a small coolant tank in a CNC lathe to a scale pit in a steel mill, Abanaki Corporation can supply a skimmer to do the job. We manufacture skimmers that can remove from 1 gallon per hour to 200 gallons per hour. We offer turnkey systems with a variety of motors, heat options, stands, and oil concentrators. Our skimmers are used on parts washers, in car washes, wells, steel mills, and any other industry where hydrocarbons need to be removed. To find out which of our skimmers would suit your application the best, please contact our experts at 440-543-7400, or click the button below to get our Oil Skimming Factbook. It is a common question asked every day by people in all fields of industry. Machine shops, steel mills, industrial manufacturers, and many others are faced with the problem of removing oils from coolants and wastewater on an everyday basis. They are faced with high disposal and maintenance costs. Some manufacturers are charged extreme amounts to have their contaminated water treated properly by their local water treatment facility. Companies look for effective ways to remove oil from water or coolant to reduce costs and the liability of proper disposal. Another reason for removing the oil is a better work environment. Letting oil remain in the coolant tank allows anaerobic bacteria to grow. Anaerobic bacteria break down the components of coolant, causing it to need changing more frequently. Oil-laden coolant with a high anaerobic bacteria content has two other drawbacks as well. The first drawback is an unpleasant odor caused by the bacteria. The second drawback the smoke generated from the oil-laden coolant coming in contact with the operating cutting tool. One of the easiest ways to remove hydrocarbons from water or coolant is by using a belt oil skimmer. It is a low maintenance, easy to use tool for removing oil from water or coolant. and collect the floating oil. 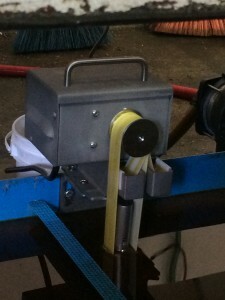 The belt passes through a set of wiper blades via a motorized head pulley where the oil is wiped off both sides of the belt. The oil then flows through the skimmer troughs and into a proper disposal container. Because the belt materials used do not attract water, very little coolant or water is picked up. Some of the advantages of using a belt oil skimmer over other methods to remove oil are the lower initial cost compared to coalescers and other filtration systems, low maintenance, no filters to change, and no mess involved as with absorbent booms or pads. With an oil skimmer, virtually the only required maintenance is replacing a belt and wiper blade set as needed. Next, Abanaki skimmers require very little operating space, usually with no modification to the tank. Finally, our oil skimmers have pick-up rates of up to 200 gph with minimal water or coolant content. Other forms of oil removal cannot perform as well. There are many instances where companies have turned their disposal costs into income. By using an Abanaki oil skimmer to remove oil from the coolant, one company was able to sell its used oil to be recycled instead of being charged to have the oil-contaminated coolant disposed of. Another money saving benefit was an extended coolant life resulting in lower coolant and maintenance costs. Because of this, the Abanaki oil skimmer paid for itself in a short period of time. To find out which of our skimmers would suit your application the best, please contact our experts at 440-543-7400, or click the button below to get our Coolant Guide Book.